A team of top-notch biologists from the University of Newcastle have racked up several world-first discoveries that will not only preserve the genetic diversity of frogs, but could also support the conservation of other species. Emerging infectious diseases, invasive species and climate change are the greatest threats to global biodiversity. Traditional conservation programs known as translocations typically fail because those threats remain present or establish themselves in translocation sites. They also don’t stop at boundaries of national parks, reserves or other conservation areas. That’s why the University of Newcastle’s Environmental Biology and Biotechnology Research Group is creating a new conservation paradigm – one focused on innovative biological interventions that mitigate threats which can’t be stopped in time to prevent extinction. They’re applying many of their discoveries to Australia’s beloved frogs. Globally, nearly 200 frog species have been lost in the past 30 years to disease, and a further 200 face imminent threat. Australia has around 250 frog species, with many of them found nowhere else in the world. We’ve already lost nearly 10 species and researchers estimate another 30 to 40 are at risk. The Environmental Biology and Biotechnology Research Group has made several world-first discoveries that offer new hope for Australia’s much-loved frogs. Responsible for wiping out more than a third of the world’s frog species, chytrid is a highly infectious fungal disease that attacks the keratin in a frog’s skin, disrupts the flow and levels of electrolytes, and eventually causes a heart attack. University researchers gained new insights about the impacts of chytrid on the endangered Australian Green and Golden Bell frogs by studying disease incidence in natural populations at Kooragang Island and Sydney Olympic Park. They found that peak infection occurred in winter, which led to major mortality events each year. The loss of breeding-age females had the greatest impact on the population, as fewer females were able produce the large numbers of spawn that would have sustained the local population. Working with industry partners, the team started a captive breeding program. From 2012 to 2016, they released 40,000 tadpoles and juvenile frogs into newly constructed habitats at Kooragang Island. After more than two successful breeding seasons, Kooragang Island is now home to a new generation of Green and Golden Bell frogs, which had not been seen in large and sustainable numbers for nearly two decades. Can simple pool salt be a frog’s saviour? In 2013 university researchers discovered that simple pool salt could be the key to stopping chytrid disease. With no cure or viable treatment for wild populations, conservation programs relied on translocations, but new frog colonies eventually succumbed to the disease which remained in the habitat. The research team observed that isolated populations in coastal areas seemed to survive despite the presence of chytrid, while inland populations weren’t so lucky. So they explored the role of salinity in preventing chytrid infection. Using every-day pool salt, they elevated pond salinity slightly (from c.0.5 parts per thousand to roughly 3 to 4 parts per thousand) and found this simple intervention blocked the infection transmission. They also saw a 70% increase in survival rates when the frogs were translocated into habitats where small amounts of salt were added to the water during winter. This research delivered the first viable, widely accessible and cost-effective treatment option for chytrid in the wild. Fungal pathogens will continue to emerge, which makes biotechnical approaches to conservation all the more critical. 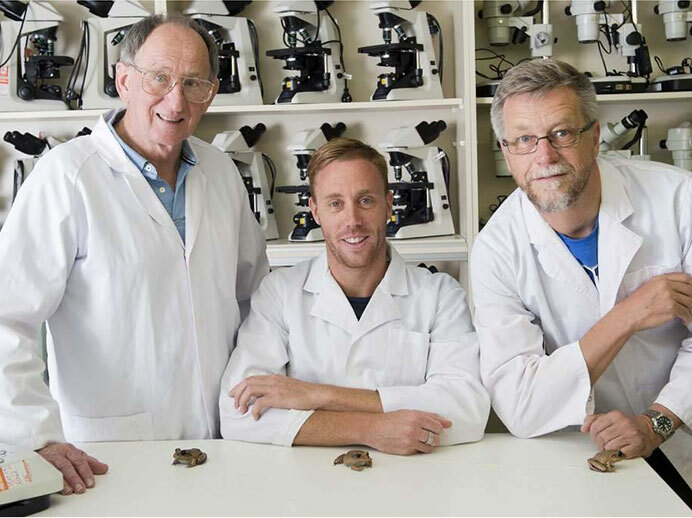 In a world-first, the Newcastle team helped revive and reactivate the genome of an extinct Australian frog using sophisticated cloning technology. The Gastric-Brooding Frog – which swallowed its eggs, brooded its young in its stomach, and gave birth through its mouth – went extinct in 1983. Newcastle researchers partnered with the University of NSW to recover cell nuclei from tissues that were collected in the 1970s and kept for 40 years in a deep freezer. In repeated experiments over five years at the University of Newcastle’s Amphibian Laboratory, researchers took fresh donor eggs from the distantly related Great Barred Frog, inactivated the egg nuclei, and replaced them with dead nuclei from the extinct frog. Some of the eggs spontaneously began to divide and grow to early embryo stage. This innovative cloning technology was one of Time magazine’s 25 Best Inventions of the year in 2013. The research team also developed a method to freeze frog embryonic cells, which could slow the threat of extinction. They separated, isolated and froze embryonic cells of an Australian Ground Frog using cryo-preservation techniques that allow for cloning. It was the first time anyone had successfully used slow-freezing techniques on amphibian embryonic cells. Amphibian eggs are large and pose a particular challenge to researchers attempting to cryo-preserve and store frog genomes: they often shatter during the freezing process. The new technique acts as an insurance policy to buy time for species on the edge of extinction, as researchers continue to look for answers to diseases and other threats.